As part of our commitment to personal service, we try to provide you with as much information as possible BEFORE we meet. This way you'll have a better understanding of how we do business and how we approach land surveying. If you have a question not listed here, give Norm a call at 573-406-5533 or use our contact form to get in touch. Question: Will you meet us on our farm or property? Answer: Yes, of course. We realize how valuable your time is and are committed to provding personal service to our customers. Question: We're under a tight deadline, can you meet it? Answer: Whether we can or can't meet your deadline, we'll be upfront and honest with you from the start. Very often we can handle urgent survey requests. Question: What types of surveys do you perform? 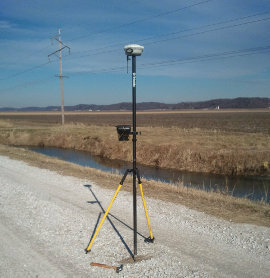 Answer: We specialize in land surveys. For a full list, check our Services page. Question: When is a survey needed? Answer: That depends on a lot of factors, but certainly prior to purchasing land, building a house, installing a fence or other structure, prior to dividing land or when you think others have encroached onto your property. Question: What information will your need to conduct a survey? Answer: We need the following: your name, address, phone number, the Parcel Identification Number (PIN), Deed Book and page number, GIS (Geographical Information Systems), tax information, plats, and any older surveys of the same land. Question:Which professional associations are you a member of? Answer:Norm Ellerbrock is a member of the National Society of Professional Surveyors (NSPS), the Missouri Society of Professional Surveyors, and the Illinois Professional Land Surveyors Association.